According to estimates from the International Atomic Energy Agency (IAEA), global reliance on nuclear energy will double by 2030, with the number of nuclear power plants (NPP) rising by 60pc. As President Dmitry Medvedev put it recently, Russia could claim a quarter of the world's "nuclear pie". Why are so many countries focusing on nuclear energy? The answer is simple: the world needs a cheap and reliable power source. The pressure of high oil and gas prices, coupled with the need to cut greenhouse gas emissions, have superseded fears over nuclear power. There are 10 nuclear power plants (31 power-generating units) in Russia, and they generate 16pc of the country's total electricity supply. By 2015 there will be 40 power-generating units, providing a quarter of all electricity. In China, NPPs produce 2.3pc of domestic output; in the US it's 20pc, and in France, 80pc. Over the next few years, China plans to construct about 100 plants, while the US hopes to build twice as many. The nuclear boom has boosted uranium prices by more than 10 times over the past five years, driving the cost of one power generating unit to between $5-6bn. With things as they are, countries with uranium reserves and nuclear technology will hold sway in the global power industry for the next two to four decades. Russia is a member of an elite nuclear club which offers huge future benefits. First, few countries in the world know the secrets of building state-of-the-art and reliable power plants. Second, few countries possess uranium enrichment technology. And finally, the countries producing fuel for nuclear power plants can be counted on the fingers of one hand. Russian companies are ready to provide the entire cycle of production, from uranium mining to NPP construction. Today, Russia accounts for 40pc of the world's uranium enrichment facilities, 17pc of the international fuel market, 28pc of NPP building capacity and 8pc of uranium mining. So far, Russia's uranium needs are covered from Soviet-era stockpiles of nuclear weapons, but what will happen next? To be on the safe side, Moscow has decided to secure access to foreign uranium reserves. Russia's Rosatom Nuclear Energy State Corporation has already signed uranium contracts with South Africa and Australia. Another way is to deepen co-operation with uranium-rich nations in the first place, for example Central Asian republics and Mongolia. Neighbouring Kazakhstan has the world's third largest reserves of uranium, after the US and South Africa. Mongolia is next, occupying fourth place, but its prospective reserves (1.3m tonnes) could make it one of the world's largest uranium suppliers. Today, Russia has joint uranium mining projects with Kazakhstan, Armenia and Namibia. Following Dmitry Medvedev's visit to Ulan Bator in the summer, Rosatom is also preparing to initiate production in Mongolia. Rosatom experts possess the world's most advanced uranium mining technology. Fifteen foreign companies have tried to start up uranium production in Mongolia over the past 15 years, but were unable to plough the country's virgin nuclear soil. Russia's exploration and production technology now allows for the development of deposits that were earlier deemed unrecoverable. With these resources, Russia's uranium reserves could be multiplied "at least by a factor of three, or maybe five or even 10", according to Rosatom chief Sergei Kiriyenko. Those countries that co-operate with Rosatom in uranium production will receive nuclear fuel supply guarantees for the next 60 years. Russia is also ready to offer the unique services of the international uranium enrichment centre in the Siberian city of Angarsk. Fast neutron reactors will also be instrumental in solving the uranium fuel problem. Conventional reactors can use only 5kg from a tonne of uranium, while fast neutron reactors will be able to use up to 700kg. "With fast reactors, our uranium reserves will last for a millennium," estimates Nikolai Oshkanov, director of the Beloyarsk nuclear power plant. Russia and China are currently in talks to build a new fast reactor, with a capacity of 800MW. According to estimates, Russia is 10-15 years ahead of the rest of the planet in this respect. Russia also has something to offer in another prospective area: floating nuclear power stations, based on nuclear shipbuilding technology. The IAEA values the world market for such stations at between $300bn and $600bn. They are vital for remote regions, where power lines or organic fuel supplies are inexpedient. Such floating stations could also be used to desalinate sea water, for example, in the Persian Gulf countries or on an ocean shelf. Russian nuclear reactors successfully operate in 10 countries, and there are construction projects running in three others. Another 17 nations, from Brazil and Egypt to Ukraine and the Czech Republic, are in talks with Rosatom on new projects. Russia is ready to build another four power generating units for India's Kudankulam nuclear power plant. Rosatom also has certain interests in Turkey, Southeast Asia, North Africa and Latin America. Russia has begun to use active and passive safety systems to make atomic power stations more reliable. According to RM Topchan, deputy director of the Atomic Energy Project Institute, these include the use of a trap for liquefied nuclear fuel, the installation of a defence mechanism for human error and triple back-up equipment. After the terrorist events of recent years, Russian atomic power stations have significantly increased their physical defences. As a result, and according to objective indices, Russia has a high level of security. 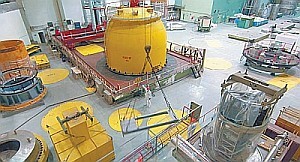 In terms of the most important criteria, for instance, the number of unplanned automatic stoppages at a reactor in the course of 7,000 hours of operation, Russia is on the same level as Germany and Japan and significantly ahead (in terms of operational reliability) of the United States and Japan.